The STIHL® TIMBERSPORTS® Series presented by Ram Trucks brings its first lumberjack competition of the 2013 season to Auburn University for the Professional and Collegiate Series Southern Qualifiers. As part of the 56th annual Association of Southern Forestry Clubs Conclave hosted by Auburn, top professional and collegiate lumberjacks from all over the south will converge on Friday, March 15 at 6 p.m. CT to compete in the STIHL TIMBERSPORTS Series Southern Qualifier. Winners of the Professional and Collegiate Series competitions will advance to the STIHL TIMBERSPORTS Series Championships hosted by The Great Smoky Mountain Lumberjack Feud in Pigeon Forge, Tenn., June 7-9. For more information on the 2013 Southern Forestry Conclave, visit http://wp.auburn.edu/conclave/. ESPNU, Outdoor Channel and TUFF TV cameras will be on site to capture the competition. These networks provide a national platform to not only highlight the competition, but also spotlight the hosting schools and their forestry programs in the Professional and Collegiate Series competition shows. The airing schedule for the Southern Qualifier on Outdoor Channel appears below. ESPNU air dates and times for the 2013 season will be announced at a later date. In the Collegiate Series, the participating universities select their best lumberjacks or jills to chop and saw in four disciplines including the single buck, standing block chop, stock saw and underhand chop, using professional-sized wood and rules. After competing in each of the disciplines, the competitor with the most cumulative points will earn a $1,000 scholarship from STIHL for his or her school and advances to the 2013 STIHL TIMBERSPORTS Collegiate Championship. In 2013, 14 schools will participate in the Southern Qualifier including Georgia, Clemson and LSU. This year marks the 10th anniversary of the STIHL TIMBERSPORTS Collegiate Series. Multiple former collegiate competitors will return to the Series this year among the pro ranks including Logan Scarborough, the 2010 STIHL TIMBERSPORTS Collegiate Champion, and Matt Slingerland, whose father, Mike, is a long-time STIHL TIMBERSPORTS Series contender. The competitive father/son duo will be competing in the Professional Series Southern Qualifier against each other for the third year in a row. Following the collegiate competition, the excitement kicks up a notch when eight of the region’s top professional lumberjacks face-off across six disciplines, the hot saw, single buck, springboard chop, standing block chop, stock saw and underhand chop in the STIHL TIMBERSPORTS Professional Series Southern Qualifier. The top four competitors will advance to the U.S. Championship. At the Collegiate Championship, the five regional competitors and one wildcard pick face off in the single buck, standing block chop, stock saw and underhand chop to determine the nation’s top collegiate lumberjack. The collegiate champion wins automatic entry into the 2014 Professional Series. In 2003, STIHL created the Collegiate Series to help develop future U.S. pro competitors. The Collegiate Series travels to college campuses across the country with the ESPNU, Outdoor Channel and TUFF TV cameras to seek out the best amateur athletes and has grown from five participating schools to nearly 60 in the last 11 years. In the Professional Series, the top four pros from each Qualifier advance to the STIHL TIMBERSPORTS U.S. Championship where they will compete for the coveted U.S. Championship title, a brand new Ram 1500 truck and the opportunity to represent the U.S. in the STIHL TIMBERSPORTS World Championship in Stuttgart, Germany Oct. 25-26. Additional pros will be selected by officials to represent the U.S. in the World Championship Relay Competition. Established in 1985 by STIHL, the number-one selling brand of gasoline-powered handheld outdoor power equipment in America*, the STIHL TIMBERSPORTS Series, billed as the Original Extreme Sport, attracts the world’s top lumberjack athletes in a competition based on historic logging techniques. The Series is seen by millions of viewers annually in more than 62 countries on networks such as Outdoor Channel, ESPNU, Eurosport and TUFF TV. Get the latest information, stay up to date on news and competition and access behind-the-scenes photos and videos by joining the STIHL TIMBERSPORTS Series community online and on Facebook, Twitter and YouTube. Derek Knutson, Pigeon Forge, Tenn.
Andrew Mattison, Pigeon Forge, Tenn.
Louisiana State University, Baton Rouge, La. Mississippi State University, Miss State, Miss. University of Arkansas-Monticello, Monticello, Ark. Virginia Tech University, Blacksburg, Va.
STIHL Inc. manufactures the world's largest selling brand of chain saws and produces a full line of powerful, lightweight, and versatile handheld outdoor power equipment for homeowners and professional users. STIHL products are sold through independent servicing power equipment retailers from coast to coast – not mass merchants. STIHL products sold through U.S. STIHL dealers are for distribution in the United States only. For more information or for the name of the closest STIHL retailer, call toll free 1-800-GO STIHL (1-800-467-8445) or visit STIHL's website at http://www.stihlusa.com. STIHL Inc. is the official underwriting sponsor of the STIHL® TIMBERSPORTS® Series. The series airs throughout the year on the Outdoor Channel and TUFF TV, and the STIHL® TIMBERSPORTS® Collegiate Series airs on ESPNU. 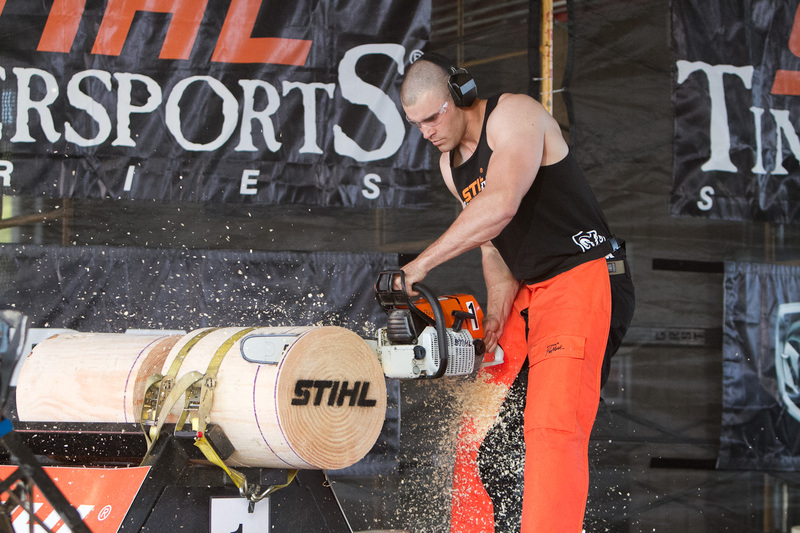 The STIHL® TIMBERSPORTS® SERIES is the pinnacle event in lumberjack sports. Since 1985 the Series has grown to become the premier showcase of the decades old sport of lumberjacking with competitions held around the world. The term TIMBERSPORTS® is a registered trademark owned by ANDREAS STIHL AG & Co. KG. and refers to the series of disciplines and competitions that are part of the STIHL® TIMBERSPORTS® Series. As such, it should not be used as a generic description of the overall sport of lumberjack sports. This trademark refers to all modifications of the term TIMBERSPORTS such as timber sports, or timbersport. The term TIMBERSPORTS should always appear in conjunction with "STIHL." STIHL TIMBERSPORTS Series pro competitor Logan Scarborough slices through the stock saw in the 2012 Southern Qualifier hosted at NC State University.